Hence the allegory of Prometheus, who steals the divine fire so as to allow men to proceed consciously on the path of spiritual evolution, thus transforming the most perfect of animals on earth into a potential god, and making him free to “take the kingdom of heaven by violence. Prometheus is not a criminal, save in the eyes of the gods. In relation with Earth, he is, on the contrary, a god himself, a friend of mankind, which he has raised to civilization and into the knowledge of all the arts. Revelers and tourists have congregated, even ice skated, before this symbol of the devil for decades. Additionally, above the statue rests a visual representation of all High Masons and occultists fervent dreams—the national flags of all the worlds countries formulated into a New World Order, under the rule of the Fallen One. 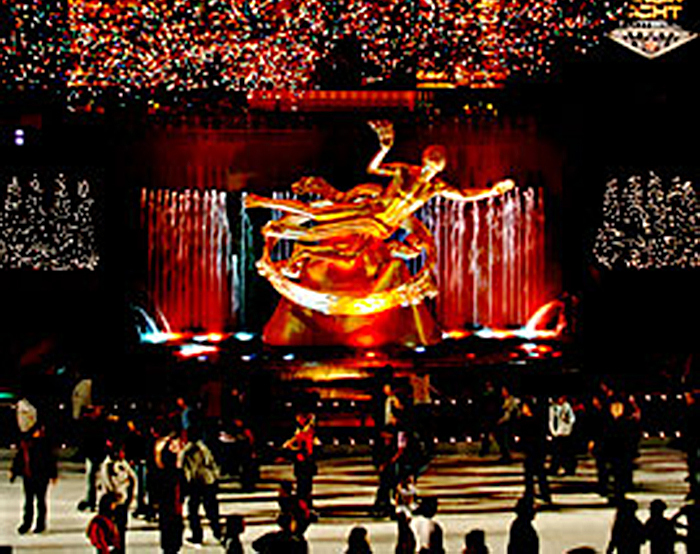 In another location in the Rockefeller Center resides the statue of Atlas, another of the Titans from Greek mythology. The bronzed figure has his arms wide, holding up the vault of heaven. Atlas has been forced to carry the celestial world on his shoulders because he rebelled against Zeus, father of the Gods and Man. Again, this allegorical representation of Lucifer is surrounded by the twelve signs of the zodiac. In classical European architectural tradition, an atlas is a temple support sculpted in the form of a man, which may take the place of a column, a pier or a pilaster.